In 1803, the good ship Obra Dinn disappeared, declared lost at sea, goods and all, having not reached its destination some six months later. Quite a lot of money went down with it, or at least, that was the case until recently – one fateful morning in 1807 – the Obra Dinn mysteriously drifted into port. On its own. Crew? Nowhere to be found. 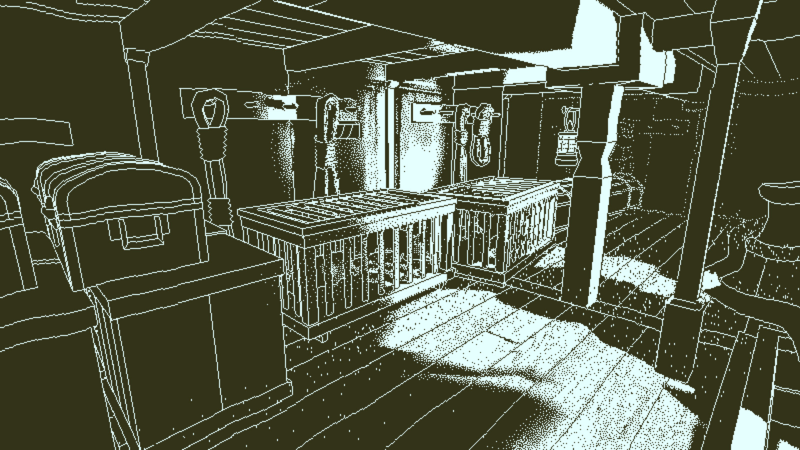 Time to step into the shoes of an insurance investigator and, well, investigate… the Return of the Obra Dinn! With damaged sails and a crew nowhere to be found, surely something fishy was going on, right? Surely. But the only way to figure out exactly what happened is to board the ship and examine every nook and cranny, starboard to bow. Based on the trailer below, something definitely took place on the Obra Dinn between 1803 and 1807. Oh, and unless I’m misinterpreting the contents of said video, the player will be able to ‘see’ past events, by rewinding time? Well, color me interested, and more than just a little too. Ain’t often we see a mystery/puzzle adventure like this after all, what with such a unique art style and in first person no less. Besides, who can resist such a mystery, merchant ship thought long-lost suddenly drifting into port… with no crew? Genuinely uncanny stuff, this here Return of the Obra Dinn. Return of the Obra Dinn is available on Steam, GOG.com and Humble Store, carrying a $19.99 price tag.